Read our fourth and final Daily News at Sibos edition of the Sibos 2017 conference in Toronto – all the latest news and analysis from Swift’s premier event of the year. 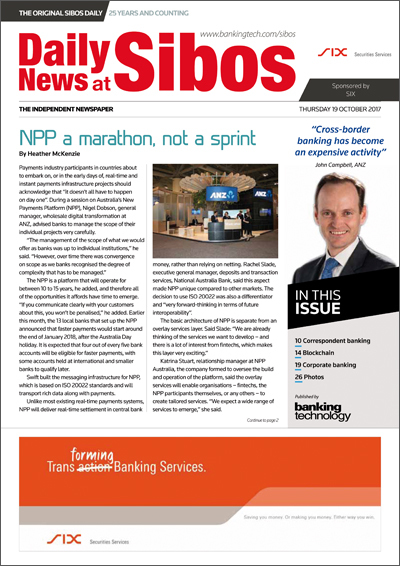 Click on the image below to read the digital edition of Daily News at Sibos – Day 4. Geoswift, a cross-border payments provider between China and the rest of the world, has unveiled its partnership with Bank of Shanghai to launch a new remittance service in 2017. Correspondent banking enables banks to access products and services which might otherwise be unavailable. By enabling cross-border transactions and access to overseas products, correspondent banking plays an important role in the global payments landscape, states Swift. Major global transaction banks are now live with Swift’s global payments innovation (gpi) initiative.